PHOENIX (AP) — A day of noisy but largely peaceful protests of President Donald Trump’s speech in Phoenix turned unruly as police fired pepper spray at crowds after someone apparently lobbed rocks and bottles at officers. A haze enveloped the night sky Tuesday as protesters and police clashed outside the convention center where Trump had just wrapped up his speech. People fled the scene coughing as an officer in a helicopter bellowed through a speaker urging protesters to leave the area. 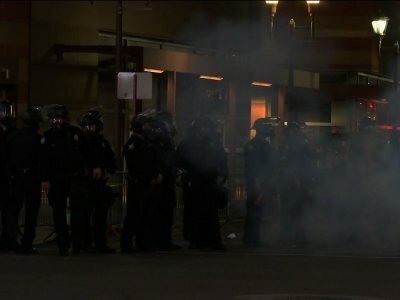 Officers responded with pepper spray to break up the crowd after people tossed rocks and bottles and dispersed gas, Phoenix police spokesman Jonathan Howard said. Four people were arrested on charges related to the protest, and one person was arrested on an unrelated warrant, Police Chief Jeri Williams said. Two officers were treated for heat exhaustion, she said. The disturbance didn’t start until after the speech had ended. A contingent of protesters stayed behind after the clash with police had ended. Their numbers were small. Authorities were on high alert as thousands of people lined up in the triple-digit heat to attend Trump’s first political rally since the violence in Charlottesville, Virginia. Protesters filled the streets of downtown Phoenix and engaged in shouting matches and a few minor scuffles with Trump supporters, but those events were generally peaceful. By the time Trump took the stage, police said there had been no arrests or major incidents. Phoenix police kept most members of the two opposing groups behind barricades and apart on separate sides of the street. Officers wearing riot gear and carrying rifles sauntered through the lane between the sides. Local authorities were vigilant in the aftermath of the deadly protests in Virginia and the president’s comments last week about both sides having blame for violence at the white supremacist rally. Mayor Greg Stanton had unsuccessfully called on the president to not hold the rally here so soon after the trouble in Charlottesville. “Toxic Trump,” read one protest sign held up to the president’s supporters streaming into the Phoenix Convention Center downtown. “Lock Him Up!” read another, a reference to earlier campaign chants by Trump and his backers about his election rival Hillary Clinton. Dillon Scott of Phoenix, who voted for Clinton, said he came out to express dissatisfaction with how long Trump took to denounce racism after the Charlottesville violence. “No one should be allowed to get away with what he gets away with, especially in political office,” Scott said. Trump backer Randy Hutson, a retired Phoenix police officer, began standing in line more than seven hours before the speech was to start. A number of opposition signs showed drawings or photos of Trump with a small, Hitler-style mustache. Three Trump supporters taunted Latino protesters with offensive comments about immigrants and held anti-Muslim and Black Lives Matter signs. As the line to get in the venue moved ahead, the two groups shouted at each other, and some skirmishes broke out. At one point, a Trump supporter and protester shoved each other. John Brown, of an anti-Trump group calling itself the Redneck Revolt, wore military fatigues and had an AK-47 rifle strapped to his chest as he and a half dozen others from the group stood about 30 feet behind the barricade for protesters. He said they were there to protect Trump opponents and stand up to fascism. “He’s offensive to me in every way,” Brown said. The outdoor temperature remained over 100 degrees as the rally began. Capt. Rob McDade, spokesman for Phoenix Fire Department, said that as of 6 p.m. they had treated 48 people for heat-related problems, most of them for dehydration. Of those, two were adult women who were taken to a hospital for further evaluation, he said. State Democratic leaders urged people who wanted to show their opposition to the president’s policies to gather at a city-designated free speech zone near the site of the rally. The message to protesters echoed those coming from law enforcement and Stanton. Stanton said he expects protesters to be “civil, respectful and peaceful.” Williams, the police chief, said First Amendment rights will be supported, but criminal conduct will be swiftly addressed. Some of Trump’s supporters were so keen to see the president that they began queuing up before dawn for the 7 p.m. rally. Treon said she wishes protesters “would be a little more peaceful instead of violently rioting, which is happening in so many places” but isn’t overly worried.